This scaffolding platform appeared across the street one day last week. 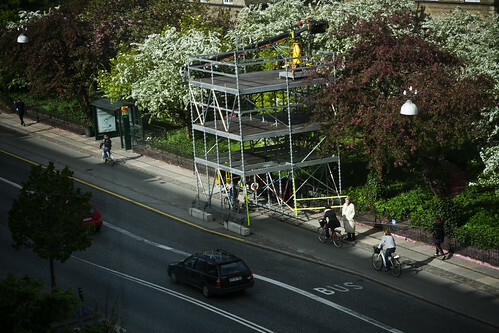 It was constructed for a camera crane - the long thing on top - for filming a scene from a drama series for Danish Broadcasting. It took all night to erect, it was used for a few hours and then took ages to dismantle. It's an interesting example of how the bike lanes have priority here. This stretch of bike lane is medium-sized, with about 10,000 cyclists in each direction each day. Blocking the bike lanes on main thoroughfares is out of the question. 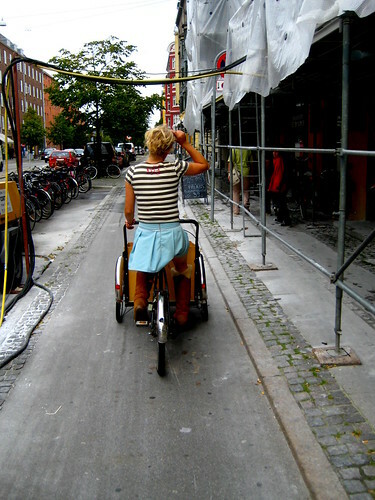 The platform allows for free access for cyclists. Usually the sidewalks must also be kept free. In this rare case, the pedestrians have to share the bike lane for a few metres, but it's only for one day. Generally, when you have construction work you must keep the lanes clear, as illustrated in the photo, above. Cables are led over the lane and nothing, as a rule, restricts the smooth flow on the pavement. 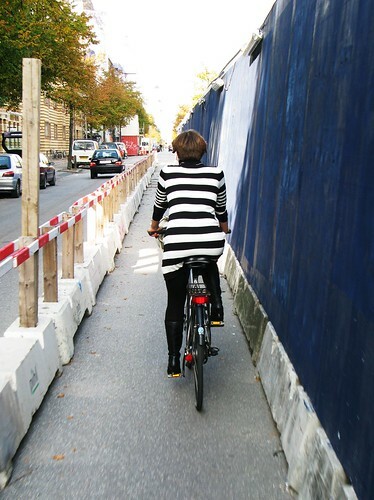 In this example, construction forced the closure of the sidewalk and bike lane. Pedestrians had to cross to the other side of the street, but space was made for a temporary bike lane on this side, due to the volume of traffic. Go with the flow. And keep the flow going. 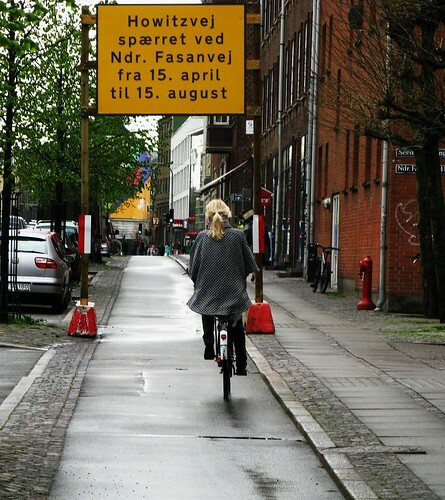 Even temporary signs for car traffic, annoucing street closures, straddle the bike lane.